Register for a performance that makes you sick; be part of simulated symptoms, enjoy our careful treatment and take the full road to convalescence, spa department and registering out. Welcome to The Central Clinic! This is the story about the concert pianist Bengt-Erik Olsson who, after 26 years of not playing, is about to perform his first piano concert. 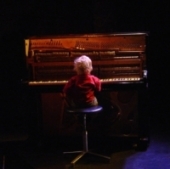 Already before his birth, while still only an embryo, his parents decided that he would be a god-given pianist and for this purpose, to instruct their son, they engaged the famous piano pedagogue Georgius Skwatznadjus. And that is what happened...Bengt-Erik grew up with Georgius as his only friend and the piano as his only toy. What happens when you grow up alone with your mentally ill, fanatically religious mother? What happens when you don't know who is punishing you any more - society, a higher power or your own loneliness and the fear of not belonging? What do we really know about the way we act? What do we do when we know that no one will be there for us? Why is it so bloody damn bad to be angry?! Huh!! An angry person is often perceived as a bad person, a person without self control. As we try to stay far away from destruction; evil; violence; we often try to hide our own anger – pretend it doesn’t exist. An angry, explosive dance drama in one act. ZOO is a theatre-video-concert-performance that is about our relation to insects, to each other and to ourselves. The audience is invited to a contemplative and playful journey that takes place in a huge greenhouse. The journey leads to both inside, outside and the outer space. The journey-mates will be a bunch of insects, thirsty for love. aktör& vänner has developed a theatre form where the space, the ideas and the feeling of togetherness are as important as the story of the performance. ZOO is an experimental and dazzling performance. In the same time ZOO is a warm adventure full of love.